DIRECTIONS: Pleasant View Cemetery is on Bonnieview Road, less than 0.1 mile from the junction with Rt .86. This transcription was provided by Nancy & Bob Cressey of the Wilmington Historical Society. This cemetery was transcribed and photographed in October 2003. ANDERSON Emma Feb 26, 1930 Jan 9, 1983 on Lawrence stone with Ryan D. Jones & Larry W.
ARNOLD Mary W. 10 yrs Jul 15, 1848 daughter of Eli & Sarah C.
AUSTIN Harold W. 1917 1965 husband of Theresa M.
AUSTIN Theresa M. 1919 wife of Harold W.
AVERY Amos 94 yrs 4 mos 10 days Oct 8, 1892 husband of Eliza B. Sanford, "Our Father"
AVERY Mary M. Miller Jul 24, 1869 wife of E. W.
BABCOCK Albert Manly 1892 1985 husband of Mary E. Campsall, name spelled Manley on F.S. BEANEY Eva M. Hathaway Oct 27, 1879 Mar 11, 1910 wife of Elmer A.
BENHAM Carrie E. Avery Apr 5, 1859 76 yrs 47 days May 22, 1935 wife of Thomas H.
BLISS Lydia D. Beardsley 54 yrs 27 days Apr 11, 1887 wife of Loammi M.
BLISS Maria B. Clifford 1839 1915 wife of James A.
BOSWORTH Bessie 1 mo Dec 19, 1883 daughter of D. A. & F. H.
BOWEN Darius Nov 28, 1823 Oct 25, 1898 husband of Mary E.
BOWEN Jennie 1884 1935 wife of Jesse L.
BOWEN Judy A. Alford Jul 29, 1942 Jul 15, 2002 wife of Robert L.
BOWEN Lewis D. 33 yrs 1 mo 12 days Sep 27, 1890 son of D. & M.
COOK Mildred O. 1897 1991 wife of Branchford J.
DRAPER Lili C. Gadeke 1909 1963 wife of Arthur G.
GEORGE Agnes M. Winch Oct 10, 1810 Mar 5, 1889 wife of Samuel C.
GROTENFELT Anna M 1902 Jul 6, 1991 wife of Oliver E.
GROTENFELT Oliver E. 1899 1982 husband of Anna M.
HATHAWAY Bertha J. 1888 1959 wife of Claude W.
HATHAWAY Claude W. 1889 1980 husband of Bertha J.
HATHAWAY Cora H. 1895 1971 1982 survey: "Cora Huffman, mother Kenneth Huffman, Church of Nazarene minister"
HATHAWAY Frank J. 1873 1954 husband of Iva A.
HATHAWAY Iva A. 1877 1950 wife of Frank J.
HATHAWAY J. Filmore 1858 1940 on stone with Delia E.
HAYES Edwin W. Nov 2, 1850 Feb 17, 1924 husband of Laura A.
HAYES Fanny 26 yrs 8 mos Dec 19, 1831 wife of Alanson, Jr.
HAYES Laura A. Feb 12, 1850 Feb 7, 1882 wife of E. W.
HAYS Esau 1 yr, 5 days Apr 16, 1847 son of David B. & Esther A.
HAYS Esther A. Preston Aug 29, 1827 May 24, 1868 wife of David B.
HICKOK Mary Jane 44 yrs Jun 15, 1862 wife of Andrew, Jr.
JAQUES Edith Mihill 1882 1949 wife of Halsey L.
JAQUES Helena Goucher 1911 1949 wife of Erwin M.
JAQUES Hervy son of P. S. & H. E.
JOHNSON Anna S. 1887 1968 wife of Victor E.
JOHNSON Victor E. 1891 1976 husband of Anna S.
KILBORN Hannah 18 yrs Jun 11, 1868 daughter of D. D. & M. P.
KILBURN Celia A. 1913 1983 wife of Vernal J., Sr.
KILBURN Gloria N. 1922 wife of Hughes L.
KILBURN Jerucha Feb 1, 1815 Aug 21, 1842 wife of David D.
KILBURN Vernal J., Sr. 1909 1964 husband of Celia A.
LAWRENCE Bessie F. Pelkey Apr 19, 1882 23 yrs 11 mos 13 days Apr 2, 1906 wife of Guy T.
LAWRENCE Elmira J. Perry 56 yrs Mar 23, 1915 2nd wife of James H.
LAWRENCE Florence E. Merrill May 12, 1860 Mar 3, 1886 wife of James H.
LAWRENCE Florence E. 2 mos 22 days youngest daughter of J. H. & F. E.
LAWRENCE Francis 4 yrs 9 mos 4 days Jul 25, 1891 daughter of S. & M.
LAWRENCE Martin 2 yrs 11 mos 5 days Jul 19, 1892 son of J. & L.
LAWRENCE Mary Feb 15, 1885 Feb 25, 1897 daughter of J. & L.
LAWRENCE Mary Conoboy 1833 1918 wife of Ralza C.
LAWRENCE Maud Potter 1892 1988 wife of Kenneth L.
LAWRENCE Millie 7 mos Sep 19, 1894 daughter of J. & L.
LAWRENCE Sarah M. Slater May 16, 1850 Jun 1, 1936 wife of Zeachria H.
LEMORA Myra J 8 yrs Feb 12, 1862 daughter of J. & L.
LEWIS Anna L. 1904 1984 wife of Clyde A.
LEWIS Clyde A. 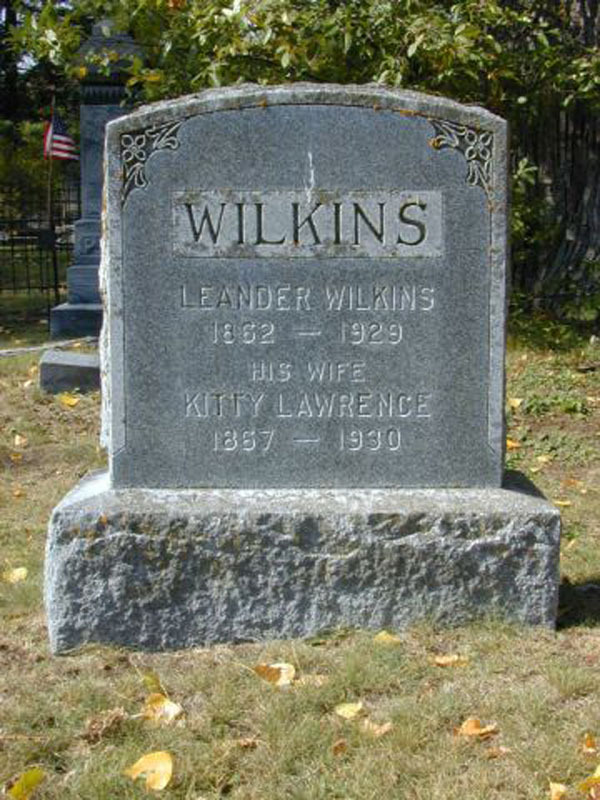 1900 1979 husband of Anna L.
LEWIS Loanda Wilkins Sep 12, 1850 Apr 11, 1917 wife of John Q.
LIEDKA Betty J. Shumway May 16, 1932 Dec 6, 1988 "Mother"
MALBONE Bertha T. Wilkins Nov 26, 1884 May 27, 1918 wife of Charles D.
MARSHALL Florence 1900 1967 wife of Gordon R.
MARSHALL Hettie 1879 1949 wife of George E.
MARTINEZ Margaret A. Wilkins 1927 1965 wife of Frank J.
MAYNARD Mary J. Longware 1847 1933 wife of Oscar F.
McGRATH Minnie George 1865 1921 wife of Henry E.
McLEOD Amanda E. Lewis Feb 18, 1849 Oct 19, 1927 wife of Enoch E.
MERRILL Mary A. Nov 16, 1815 Oct 21, 1888 wife of T. J.
MIHILL Catherine O'Neill Apr 7, 1923 wife of Winfred J.
MIHILL Lillie E. Malbone Nov 19, 1871 Apr 28, 1935 wife of Henry H.
NYE Cordy footstone near Nye headstone reads only "Cordy"
NYE John W. Jan 16, 1847 Aug 27, 1925 husband of Martha M. Bliss, footstone "Father Co L 2nd Regt NY Cav"
NYE Matha M. Bliss Apr 9, 1850 May 29, 1921 wife of John W.
OWEN Ann Smith Apr 15, 1811 Mar 24, 1892 wife of Isaac P.
OWEN Charles F. 15 days Jan 20, 1839 on same stone as Dianah J.
OWEN Leonard 58 yrs May 3, 1813 "Sacred to the memory of Leonard Owen who departed this life May 3 AD in his 58 yr"
PECK Beatrice L. Jul 12, 1933 on same stone as Donald C.
PECK Blanche Bowen 1909 1965 wife of Melvin M.
PECK Catharine Pelkey Sep 27, 1931 wife of Francis E.
PECK Donald C. Jul 29, 1923 on same stone as Beatrice L.
PECK Eva H. 1906 1967 wife of Forest A.
PECK Forest A. 1906 1948 husband of Eva H.
PELKEY Anna E. Watson 72 yrs, 1 day Jul 9, 1912 wife of Edward G.
PERKS Mabel E. Wilkins 1885 1947 wife of Frank J.
PERRY Chloe A. Larkin 1852 1906 wife of Alpheus P.
PERRY Ruth 2 yrs 21 days Sep 21, 1885 daughter of A. P. & C. A.
POND Betsey 29 yrs Nov 19, 1823 "Sacred to the memory of Betsey Pond who died Nov…Consort of Jared Pond"
PRESTON Adna 1831 1901 husband of Margaret Wilkins, "Father"
PRESTON Margaret Wilkins 1845 1920 wife of Adna, "Mother"
PUTNAM Cassie A. Lawrence 1884 1980 wife of Harry L.
REX Esther M. wife of Harry W.
RICHARDS Amanda F. 73 yrs Feb 14, 1933 wife of John J.
ROBERTS Shirley A. Cook 1932 1985 wife of James C.
SANFORD An Infant 4 days Sep 27, 1804 son of Reuben & Polly C.
SANFORD Perlina 1 yr 6 mos Mar 12, 1808 daughter of R. & P. C.
SHUMWAY Linnie A. Stowell 1868 1946 wife of Herbert A.
SHUMWAY Mamie 1893 1955 wife of Charles Sawyer, stone inscribed "Mother" and " Erected by dau Mary"
SHUMWAY Raymond L. 1899 1981 husband of Tessie M.
SHUMWAY Tessie M. 1910 1980 wife of Raymond L.
SLATER Mary A. Jackson Aug 15, 1834 Feb 3, 1912 wife of Jacob A.
SOUTHMAYD Infant son Jun 2, 1848 Jul 3, 1848 son of S. & L.
THAYER Sally Jagworth 29 yrs 8 mos 6 days Dec 5, 1852 wife of B. B.
THAYRE Jared 55 yrs Nov 4, 1855 husband of Betsy B.
TOUSLEY Essie I. Feb 1, 1908 Aug 18, 1908 daughter of L. & E.
TOUSLEY Essie I. Lawrence 1882 1908 wife of Leon D.
WARREN Carline E. May 8, 1824 Jan 24, 1896 wife of W. W.
WARREN Carrie Bell 7 mos Feb 13, 1873 daughter of L. & E.
WARREN Infant son 3 mos Dec 27, 1882 son of L. & M.
WARREN Lucy C. 15 mos Sep 28, 1877 daughter of L. & E.
WHITMAN Flavilla 24 yrs Aug 22, 1830 wife of Joseph G.
WILKINS Amy M. 1958 daughter of Wallace W. & Ina E.
WILKINS Clifton E. Feb 18, 1890 Dec 25, 1904 son of H. & L. Wilkins, on stone with Susie J.
WILKINS Edeth M. Jan 16, 1888 Jan 16, 1891 daughter of Leander & Kittie, "Our Pet"
WILKINS Emeline L. Fuller 1841 1915 wife of Landin M.
WILKINS Harold R. 1931 1993 husband of Judith A.
WILKINS Ina E. 1935 1995 wife of Wallace W.
WILKINS Isabell 1855 1912 wife of William S.
WILKINS Judith A. 1938 wife of Harold R.
WILKINS Laura E. Marshall 45 yrs May 2, 1910 wife of Henry J.
WILKINS Margaret 1845 1920 wife of Adna Preston, "Mother"
WILKINS Rose Haseltine 1852 1911 wife of Onias C.
WILKINS Susie J. Sep 28, 1895 Dec 17, 1904 daughter of H. & L. Wilkins, on stone with Clifton E.
WILKINS Wallace W., Jr. 1965 son of Wallace W. & Ina E.
WOLFE Florence Sheldon 1876 1942 wife of James C.
WOLFE Geneva M. 1912 1994 wife of Morris C.
WOLFE Grace A. Sep 30, 1896 Aug 11, 1946 aunt of George V., Jr.
WOLFE Morris C. 1904 1974 husband of Geneva M.
WOLFE George V., Jr. Nov 27, 1925 Mar 7, 1942 nephew of Grace A.
WOODSIDE Clara E. Lawrence 1877 1969 wife of Herbert R.
WOODSIDE Helen Murray wife of Roy H.
WOODSIDE Lawrence R. 1912 1939 brother of Roy H.
WOODSIDE Roy H. 1909 1958 husband of Helen Murray, brother of Lawrence R.